“Finished” is always relative for me; there are tweaks I’d like to do, I’d love to get his skin tone back up to the rich Av Sunset he was before I washed him (as would my wife, who offered to commission me painting one up looking like that after she saw how the wash wrecked his skin). I had the same problem with my Carnosaur, but I think it’s definitely taught me to exercise greater care with my washes. I am proud of this figure, though, for the early greenstuff work and the little flourishes with his wings. Thanks to the Vargheists for the donation. I’m also quite pleased with the copper, and the skull–though you can’t really see it here–is drybrushed gold. I had some of the actual gold dry paint, but that stuff…that stuff’s gross. I don’t know if I have a bad bottle or if I neglected it at some point or if it’s supposed to look like Bill Cosby tripped and dropped his Jell-O directly into a GW vat, but the substance I was provided does not seem to be paint. I have problems with a couple of the dries, though, so it could just be that I don’t know how to use them. 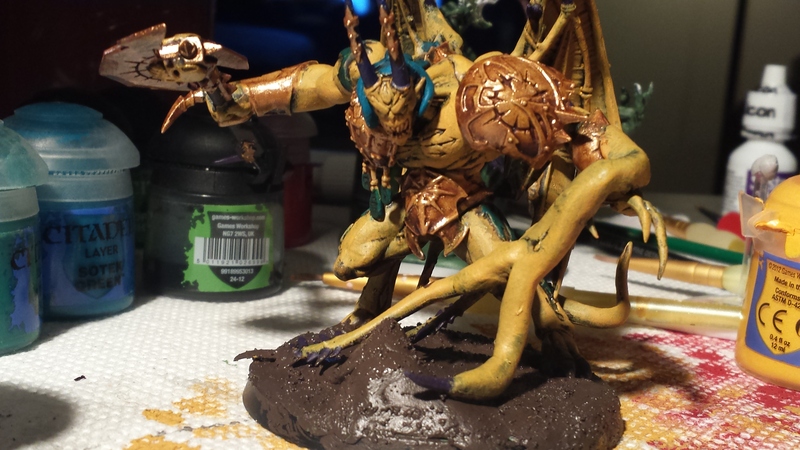 In addition to gradually lighting (or possibly glazing) the DP so that his yellows pop, I’ve also toyed with freehanding huge eyes on the back of his wings, like antherea polyphemus. The Greek mythological reference is just icing, but mostly I thought that giving him mothlike markings would be a nice little creepy touch. into a Nurgle-dedicated Prince or use the entire Prince’s worth of bits still in the box to make one up special. The Twins could certainly work for Tzeentch, though that’s a god I don’t have much truck with beyond his Screamers. Could also work for Khorne too, but who does that? 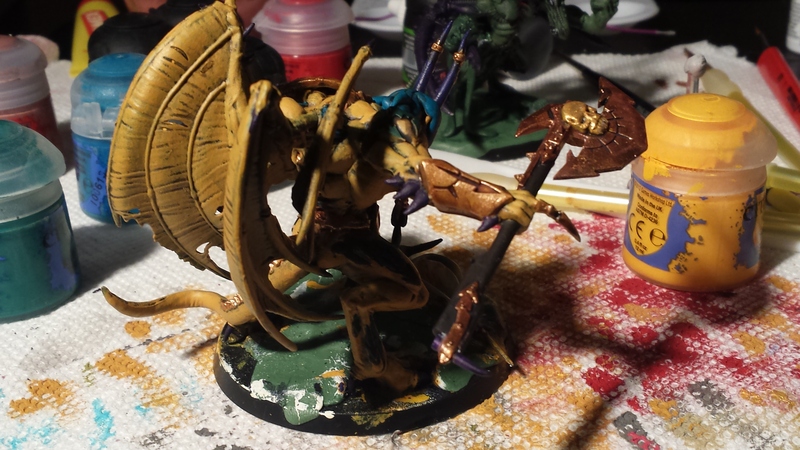 I’ve been plugging away at some other painting projects, most notably some Possessed. They’re all coming out looking like Insecticons, so that’s odd. I’m also trying to push through the tedium of painting my Chaos Marines themselves, which contrasts with the experimentation I’ve put into the Possessed but not in a way that I find actually motivating. Still, I like the way they look once they’re painted and it’s honestly a pretty quick and simple scheme. I have coats and early washes on the two non-champ Bikes, so those’ll likely get done tomorrow. 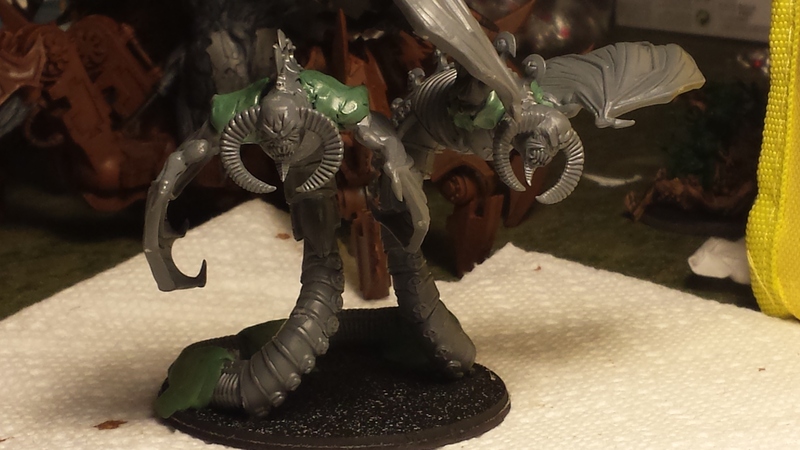 I’ll also snap a picture of the three Screamers I just did up, because I really like how they came out. I basically used the Lizardmen Carnosaur scheme, but emphasized black about equal to white. They look very different from my other skyfish, which is my aim with that particular unit. Posted in Greenstuff, Painting, Warhammer.Tagged Warhammer 40k.